While we're all accustomed to hearing it, those people are usually right. No one wants to deal with a cold night and a broken heating system. That's where the experts at Cherry Hill HVAC Contractors come in. Our heating repair technicians are experienced and licensed in the state of New Jersey to repair your heater and furnace. Unexpected damages can be frustrating, and you deserve to have peace of mind. While you're getting blankets out of storage and breaking out the cocoa cups, you can count on our technicians to get in and out of your hair in no time flat. After all, when you need your heating system repair in NJ, who wants to hassle with repair men coming in an out of your home constantly. We've seen other companies' technicians have to stick around for days on end just to fix one simple problem. Nobody we know wants that! Your home is your sanctuary, and it should stay that way. You can count on us at Cherry Hill HVAC Contractors to have you back to relaxing on your couch with a hot cup of cocoa, enjoying a nice warm room in no time. But, don't let us stop you at your Winter heating repairs. We aren't just one of the best heating and furnace repair companies in the Cherry Hill area, you know. We are also experienced and licensed with air conditioning repair! On those particularly warm nights in-between seasons, or for the dreaded Summer heat itself, we have you covered. Our repair technicians are fully HVAC certified by the state of New Jersey and have the expertise to quickly asses and take care of your air conditioning problems. A major stress for any homeowner is coming home from a long day, just to find that their air conditioner has broken. This would leave anyone grumpy. Our repair technicians are there to save your day and take some of that stress away. Whether you're looking for same-day service, or want to come home tomorrow afternoon to a cool home, we can set an appointment that works with your hours. Having the right HVAC technicians working on your air conditioning and heating systems is important. Heating and air conditioning repair is taken very seriously in the state of NJ, and all repair technicians must have a license to work on HVAC for either residential or commercial systems. It's important to know that, unless you are certified and trained to do so, you shouldn't try to repair your air conditioning or heating system yourself. These systems can be dangerous if they're not handled properly, and can cause injury to the person working on it as well as further damage the unit. It didn't just stop at the tools, we've seen some people injured by sharp metal, gas leaks, and very hot (or frozen) metal. There are a number of things that can go wrong in a HVAC system. You're not only wasting your money on tools and your time on troubleshooting every new problem that pops up, you're putting your personal health in danger, as well as anyone else in your home (including pets) if the problem is not resolved correctly. In the end, it only makes sense that when you're choosing the right heater repair company you'll want to do your research. Choosing the right technician is crucial. You have the find a qualified technician, then someone in the right area, and lastly the right price for your budget. Cherry Hill HVAC Contractors prides themselves in being friendly to their customers, having the job done right, and having service hours to accommodate everyone they can. We value research, and that also includes knowing the danger signs of a damaged air conditioning or heating unit. 1. Rotten egg, or sulfur smell. Most people know that sulfur is supposed to smell like rotten eggs, but not all of us have gotten the chance to actually smell it. This should not be a normal smell in your home. Call a technician immediately to come asses the problem. This smell could be natural gas leaking from your heating or air conditioning unit. This is more common for furnaces and heating units. This may seem obvious to some people, but sometimes you think just because there's no smoke or wall damage, that nothing's actually burning. This electrical smell may be damage in your HVAC system's wiring. Shut off the unit immediately with the master shutoff switch or valve and call a professional to asses the problem immediately. An electrical fire is a very real threat, and air conditioning and heating units make up a whopping 13% of all United States residential fires. Mustiness isn't a pleasant smell, and mold is one of the leading causes of bacteria-based illness in households. Often times, mold isn't even visible in your home. Moisture build up can create a breeding ground for mold, fungus and mildew. Air conditioning units are one of the main sources of such moisture in your home. Calling your local HVAC technician can help save your home, and your lungs, from the perils of moldy smells and bacteria. They can quickly asses the problem, find where the mold is breeding and often the source of the problem. Your furnace's job is to burn and keep your home warm. However, it should never have a burning odor to it. Often times, this is caused by an oil leak in your system. This oil burns off of the unit and the odor can be pulled into the ventilation system. Now, if you just bought your heater, this is no cause for alarm. Most heating units are coated thinly with an oil to ensure a smooth start up once installed. This smell can last up to 24 hours. If the smell continues beyond that time-frame, turn off your heating system and call your HVAC technician to have him asses the situation and see if there are any problems. 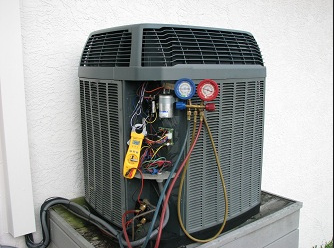 ​If your heating or cooling system needs repair in the Cherry Hill, NJ area, you know who to call. Cherry Hill HVAC Contractors ensures that all of their technicians are trained and up-to-date on the latest news and technology of air conditioning and heating systems. Proper maintenance and repair of HVAC systems reduces the chances of a house fire, creates cleaner airflow in your home and makes sure you're comfortable through both Winter and Summer. Give us a call at 856-302-0196 and we'll book your appointment today.